1200s repainted in 1579. 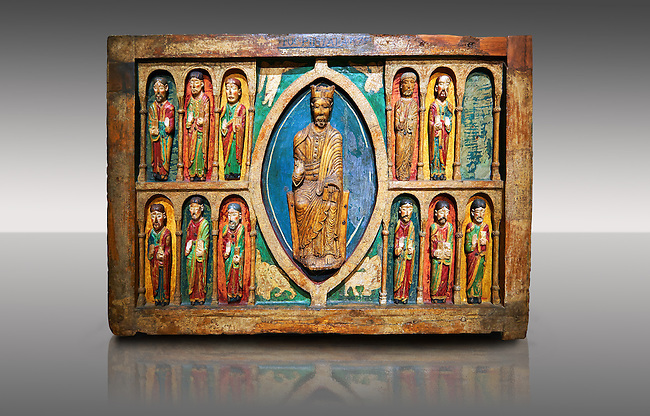 Tempera on wood with carvings from the church of Santa Maria in Snowshoe, Vall de Boi, High Ribagorca, Spain. Thirteenth century Romanesque carved and painted altar front with Christ Pantocrator in a Mandorla flanked by the 12 Apostles. Carved altar frontals were not rare in Romanesque. Generally the characters were sculpted separately and then added to the front surface. The high quality of carving indicates the presence of a sculptures hand. The sharpness of forms to make stereotypical costumes seem versed in the work of stone sculpture.